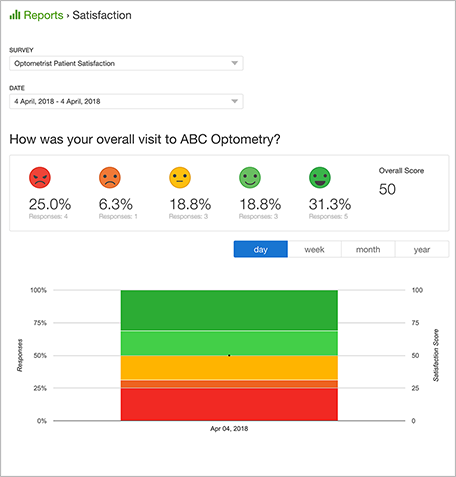 Measuring patient satisfaction at your optometry clinic can help you understand requirements for improving quality, care, and referral rates. 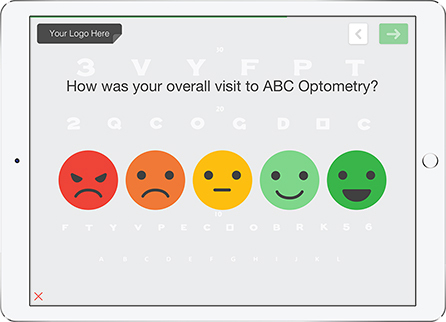 This Optometrist patient Satisfaction Survey template can help improve your patient experience and elevate your practice to a new level of care. 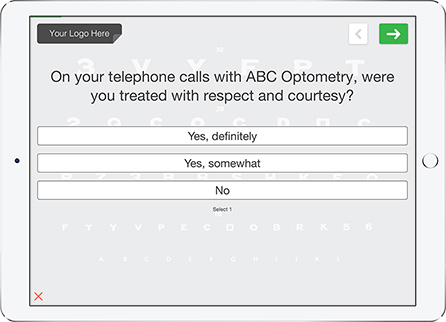 Do you need an easy and insightful way to gather patient feedback at your optometry clinic? If you want to improve your practice and increase your business, you must gather customer feedback survey data from your patients. 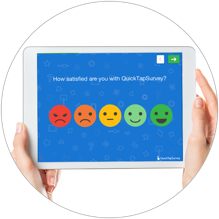 QuickTapSurvey can help you collect feedback and analyze your data with beautiful surveys and robust analytics and reporting tools. 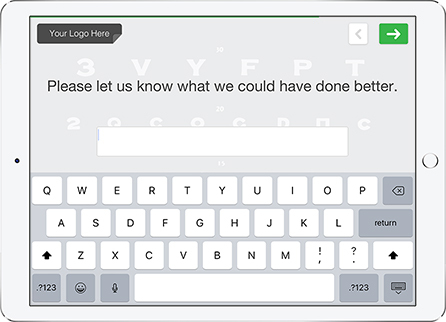 Get started with your very own patient feedback survey in minutes! 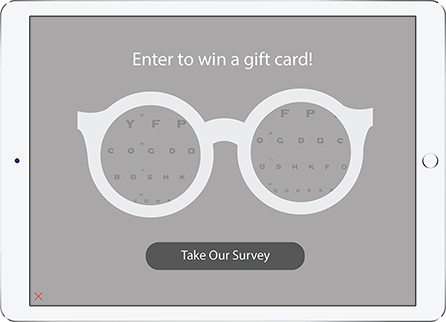 Do you want to match your survey to your brand? 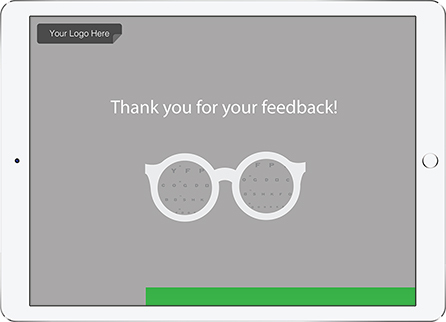 Our survey builder tool allows you to upload a custom logo, replace the survey background, and customize your survey button and font colours. Convert your tablet into a kiosk by mounting your tablet in a kiosk enclosure. This solution works well for unattended data collection. Take advantage of our powerful reporting and analytics tools to view your data and take action to improve your practice. 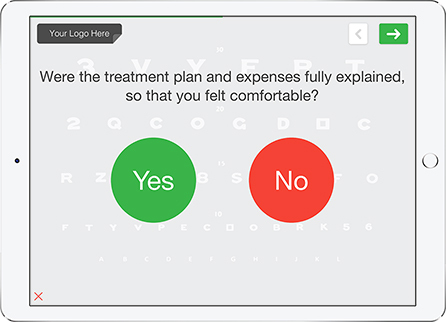 Depending on the feedback your patients have provided you can select which questions to show them next in the survey. Immediately send a response by email to your patients once they’ve submitted their contact information. 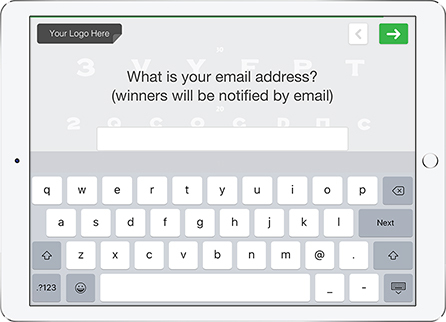 Customize your email content and layout. Sign up online and create your patient satisfaction survey using our survey builder. use this template as a starting point or build your own in minutes. 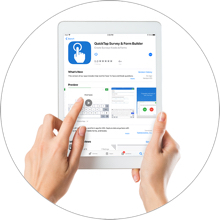 Download the QuickTapSurvey app on your tablet from the App Store or Play Store. You’re ready to start collecting data once you’ve synced your survey to the device. 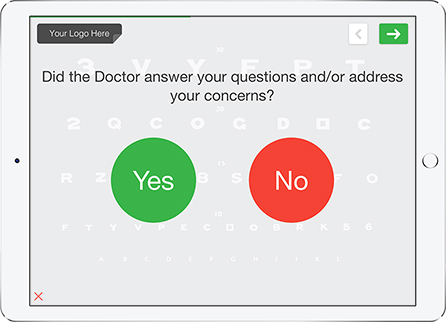 Gather patient feedback from patients on your tablet. You can even place your tablet in a kiosk if you’d like to collect feedback unattended. Review your feedback data, export it in your preferred format and visualize the data in generated reports. Are you ready to supercharge patient satisfaction? QuickTapSurvey’s reporting and analytics features can help you take your optometry practice to the next level! We make it easy to understand and benefit from your survey data, with many useful reporting and analytics tools available through the QuickTapSurvey app. 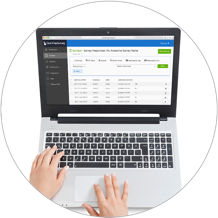 Review and assess the data you’ve collected in one place, and download it in a variety of formats. 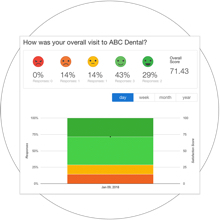 Generate different kinds of reports, including an Analytics report, an Active Kiosk report, NPS reports, and Satisfaction reports.